This is Part 6 in a series on the South Africa Ministry Network. Read Part 1 here, Part 2 here, Part 3 here, Part 4 here and Part 5 here. I recently had the privilege of being part of the group that went to South Africa alongside the CBF South Africa Ministry Network in July for a week-long mission experience. One night after work, our group of about 50 gathered in a circle to talk about the day, and at the end of this meeting we were asked if anybody had a “shout-out” that they wanted to give to somebody else for what they had done that day. I had a story I wanted to share, but was unable to do so because I was pretty sure there would be no way I could get through that story without crying, and I never cry. I feel fortunate to have this second chance to share something that I saw that day. To fully understand this story you must know that I like to “mind my own knitting” — meaning I like to focus on my responsibilities and try to not worry about things that others are doing. My responsibility during the mission experience was playground construction. 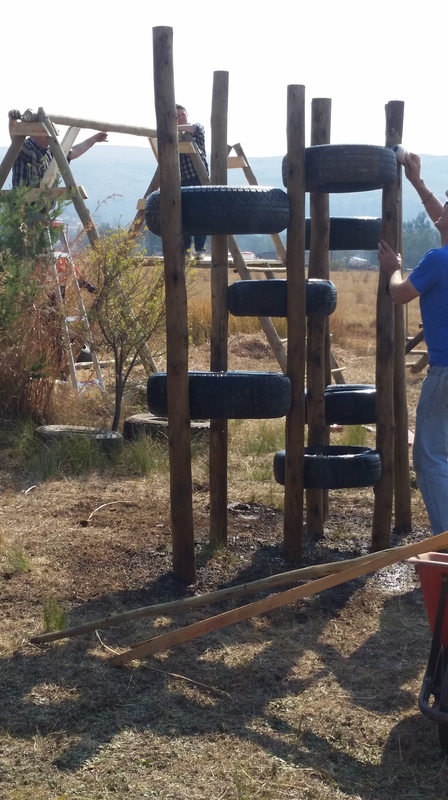 I was not doing this alone, but I was the one who had bought the hardware and tools from the U.S., and I was quite consumed with what we were going to find when we arrived at Thembalethu, where we were building the playground. Thembalethu is a faith-based nonprofit organization in the KwaZulu-Natal province which provides home-based care to those suffering from HIV/AIDS as well as community services for vulnerable children in the area. We were tasked with using old tires to create something fun. I had zero experience with that. I didn’t know if I had brought the right tools or the right hardware, where we might be able to buy lumber, how many tires were we going to to find, etc. Earlier that morning, we got on a bus and started off to Thembalethu (for the first time). There were about 12 of us—most of whom were from my church (FBC Chattanooga) — but there were also three other women. Two of these women I met on the bus, and in my mind I referred to them as “the nurses” (original I know — they were, in fact, nurses), and the other was Dora, whom I had met the previous day. Dora was going to Thembalethu with us, and the nurses were going to do something called “home health visits.” I was busy minding my own knitting. We stopped on the way at a small collection of shops to meet Betsy, the director and founder of Thembalethu. I wish I had the space to tell you about her and the organization — she is an amazing lady with an amazing story doing amazing work. I wandered in the shops to have a look around, and when I came back out we were ready to leave. I had completely missed Betsy’s arrival and her appeal to us for more volunteers to do “home health.” On the bus I heard that Betsy had gotten 2 more home health volunteers, Dora and my friend Ann-Marie. I was busy minding my own knitting. 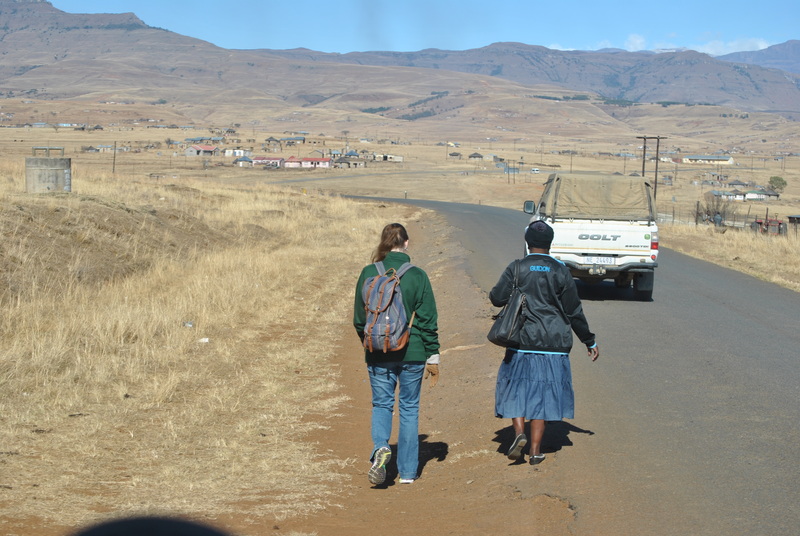 As the bus took off we were following Betsy, driving a small truck, and an announcement was made that we would have to make a few stops before Thembalethu. One of the nurses responded with something like, “I guess that’s me,” and got off the bus to join the conversation. This got my attention — I was wondering what they were discussing. Next thing I know, Betsy is heading back to her truck, and she takes off. Bus door closes, and we follow. Nurse left on side of road. We were in the middle of nowhere in South Africa. Dirt roads. Cows wandering everywhere, seemingly on the loose. And now joining the cows: our nurse. Things had gone a little quiet, but it was hard to determine if anybody was completely freaking out like I was. Then I start thinking about my friend, Ann-Marie. It is one thing to leave a woman you just met on the side of the road in rural South Africa, but I was finding it a completely different matter to contemplate leaving Ann-Marie, a woman I have known for more than 20 years, whose children grew up with my children, on the side of the road. The only thing that stopped me from basically forbidding Ann-Marie to get off the bus was that I know her very well — well enough to know that she had zero interest in my views on the matter, and there would be no stopping her. So the scene is repeated three more times, three more women dropped off on the side of the road in rural South Africa. I have often wondered who was the bravest, the woman who did it first, or the women who did it later, who had seen their friends getting smaller and smaller as we drove away. I also wonder if I would have been brave enough to get off that bus, and I am unsure. This story does have a happy ending: all boarded the bus to return at the end of the day. Although, I did hear from one of them that as she was waiting on the side of the road to be picked up, and the sight of that bus coming down the road was the most beautiful thing she had ever seen. So this is my belated “shout-out” to those four brave women. With God all things are possible. Steve Kusenda is a member of First Baptist Church in Chattanooga, Tenn.